Lieutenant Tiffany Grimes is a rising star in the Navy. She has a date with destiny. In the high-tech world of advanced secret weapons, the ability to trigger terrifying earthquakes and direct devastating storms has been mastered by the military. Vice Admiral James Billingsly now controls America’s most powerful new weapon of mass destruction, which he secretly uses to impose his own warped moral code on an unsuspecting world. He, too, has a date with destiny. 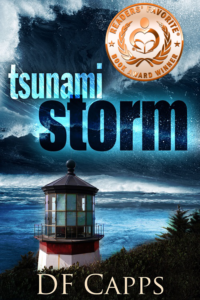 As the U.S. and China are relentlessly drawn to the brink of war, the only protection for the Pacific Northwest coast is one U.S. submarine and its heroic crew against a truly catastrophic event. In this hard science fiction technothriller you will encounter a major earthquake, the elements of an international political thriller, the new face of terrorism, advanced military technology, and the unmitigated disaster that must inevitably result. You will also meet the protective mother archetype in Willa McBride, mayor of Dolphin Beach, a small resort destination on the Oregon coast, as she is faced with the impending destruction of her beloved town, and the loss of the people she protects as if they were her personal family. While Willa’s sister, the ambitious Senator Elizabeth Bechtel from Oregon, jostles with inside knowledge of a dangerous conspiracy, and tries to take advantage of a desperate situation, the heroic crew of one of America’s most advanced submarines is faced with devastating choices, duty, and personal sacrifice. It’s an adventure you won’t want to miss.